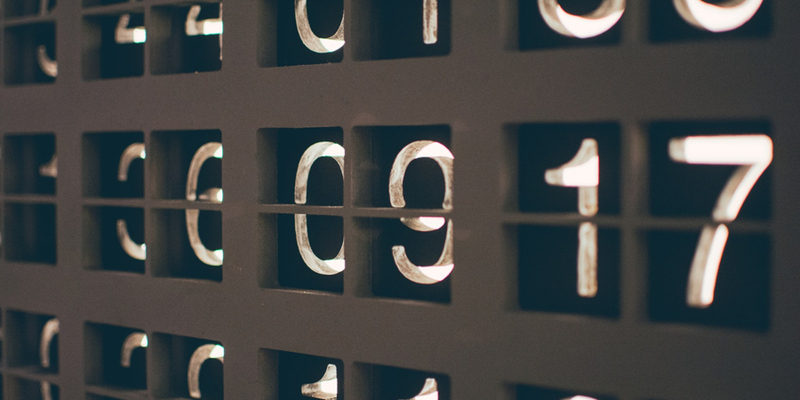 The analysis of categorical data has a long history and can be traced back to some of most influential statisticians: Karl Pearson and Sir Ronald Fisher. In 1900, Pearson first introduced the -statistic and thus the initial versions of the now known multinomial test and goodness-of-fit test. Today, the multinomial test and the goodness-of-fit test have become a standard procedure for the empirical sciences. The multinomial test checks whether the observed cell counts are uniformly distributed and the goodness-of-fit test determines whether the observed cell counts deviate from a particular expected distribution. Both tests are now implemented in JASP 0.8.6. You can replicate all analyses in this blogpost by downloading either our example dataset as a .csv file or the full analysis as an annotated JASP file from our OSF folder. As an example, consider the study conducted by Uhlenhuth, Lipman, Balter, and Stern (1974). To investigate the connection between life stresses and illnesses Uhlenhuth et al. (1974) asked 735 participants to indicate which life stresses, negative life events, and illnesses they had experienced in the past 18 months. A subset of this data set was reanalyzed by Haberman (1978, p. 3). More precisely, Haberman investigated those 147 participants who had reported only one negative life event over this time span. The objective of Habermans reanalysis was to show that through the fallibility of human memory such retrospective surveys become unreliable; participants simply forget negative life events and illnesses the further in the past they have occured. 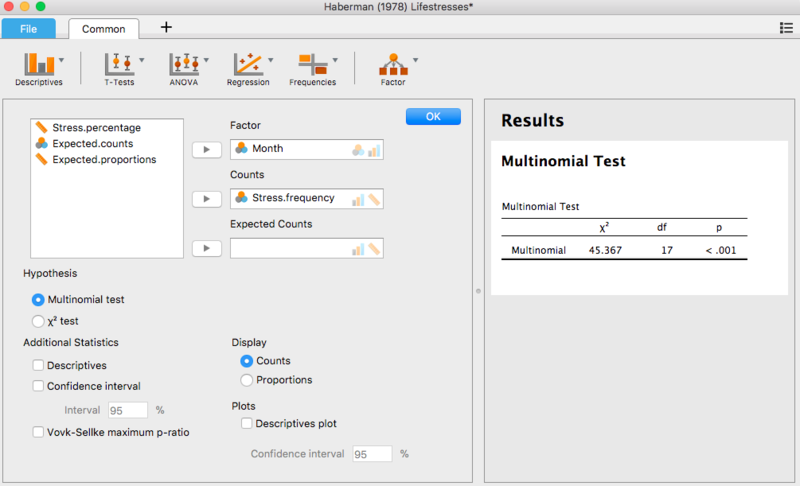 Haberman was interested in whether he could reject the hypothesis that the frequency of reported life stresses was equally distributed over the 18 months period. For that, he conducted a multinomial test. If the results indicate they they are not equally distributed it would question the reliability of retrospective surveys and hence the results from Uhlenhuth et al. (1974). 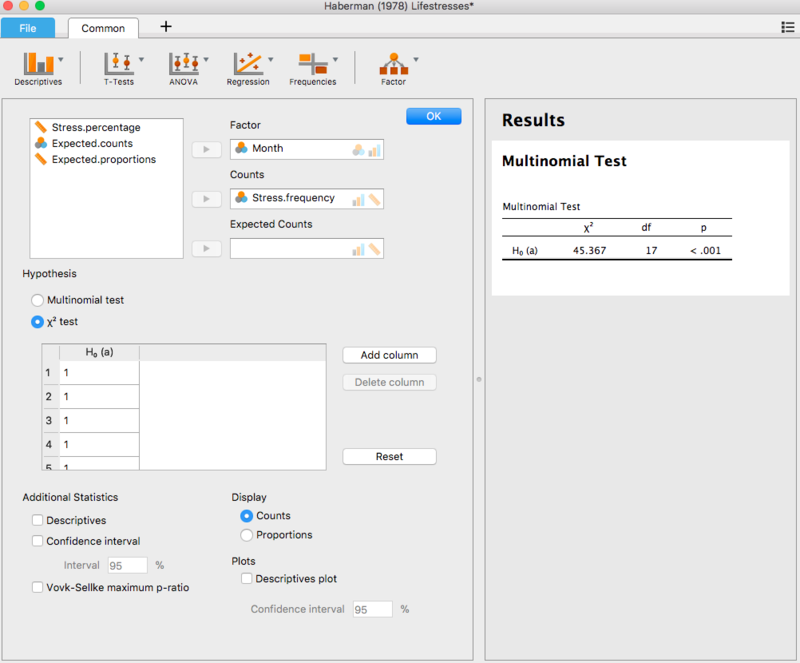 To conduct the multinomial test in JASP we select in the ‘Common’ analysis menu in the ribbon ‘Frequencies’ and then ‘Multinomial Test’. The field ‘Factor’ refers to the categorical variable that we are interested in. In our example this is the variable ‘Months prior to the interview’ which is abbreviated as ‘Month’ in our dataset. 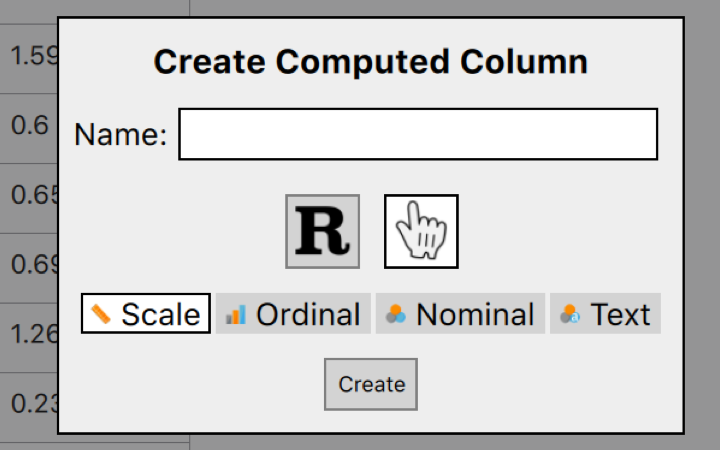 In the field ‘Counts’ we indicate which column in our data set contains the count data. In our case we drag the variable ‘Stress.frequency’ in this field. 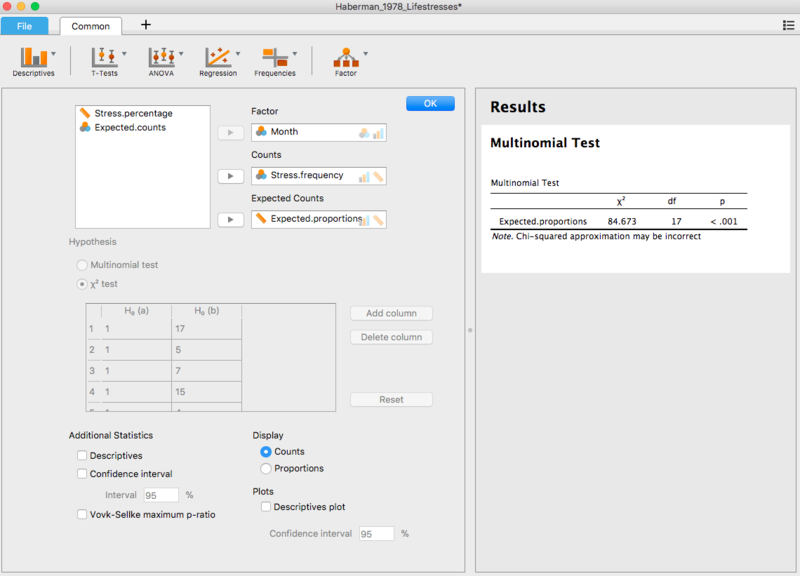 Note that the multinomial test not only works for count data but also for normal factors. In this case the counts will be derived automatically from the factor and do not need to be specified in the ‘Counts’ field. The multinomial test is a special case of the goodness-of-fit test. Just like the multinomial test the goodness-of-fit test investigates whether the observed distribution of cell counts corresponds to a expected distribution. However, in the goodness-of-fit test the expected distribution is not restricted to a uniform distribution but its shape can be arbitrarily adapted. Using a goodness-of-fit test we could, for instance, test whether the data from a replication experiment follow the same distribution as the original data. In JASP we can enter our expectations manually. To do this, we indicate under ‘Hypothesis’ that our null hypothesis is no longer the one under the ‘Multinomial test’ but the ‘Chi-square test’. 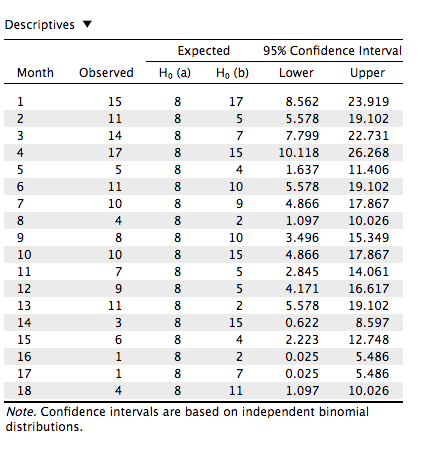 For both the descriptives plot and the table the calculated confidence intervals are based on the independent binomial distributions of each category. 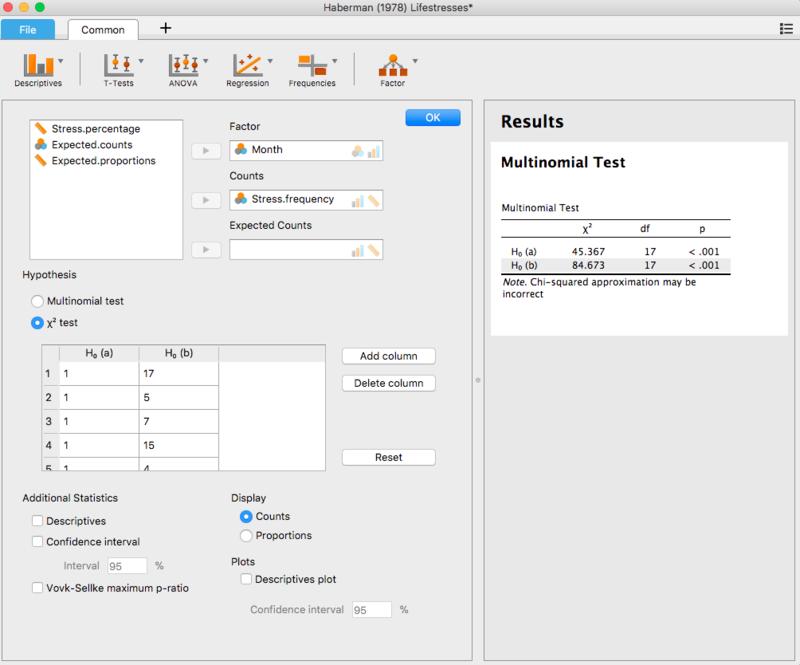 For more information on how to interpret the Multinomial test or the goodness-of-fit test, see here or here. 1 This GIF shows how to change the general settings in JASP to display exact p-values. Haberman, S. J. (1978). Analysis of qualitative data: Introductory topics (Vol 1). Academic Press. Uhlenhuth, E. H., Lipman, R. S., Balter, M. B., & Stern, M. (1974). 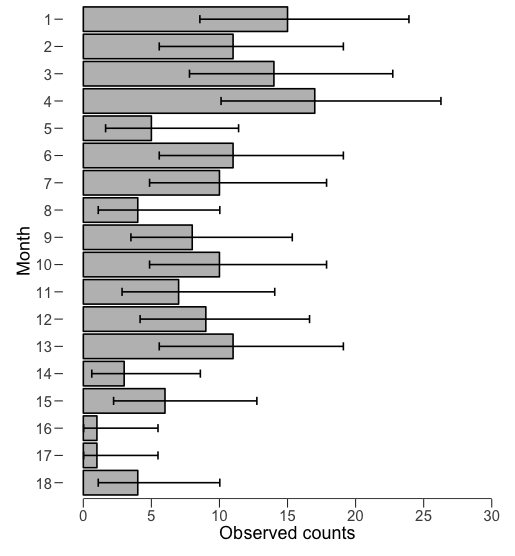 Symptom intensity and life stress in the city. Archives of General Psychiatry, 31, 759-764. 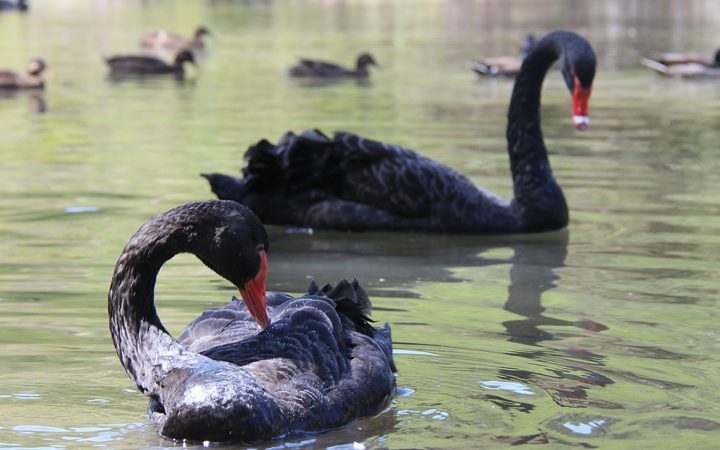 Alexandra Sarafoglou is a PhD candidate at the Department of Psychological Methods at the University of Amsterdam. At JASP, she is contributing to the multinomial analysis, and the video tutorials. Alexandra is also part of the workshop organization team. Erik Jan van Kesteren is a PhD candidate at Utrecht University. At JASP, he is responsible for adding plots, functions, and UI elements, and interfacing R and C++.